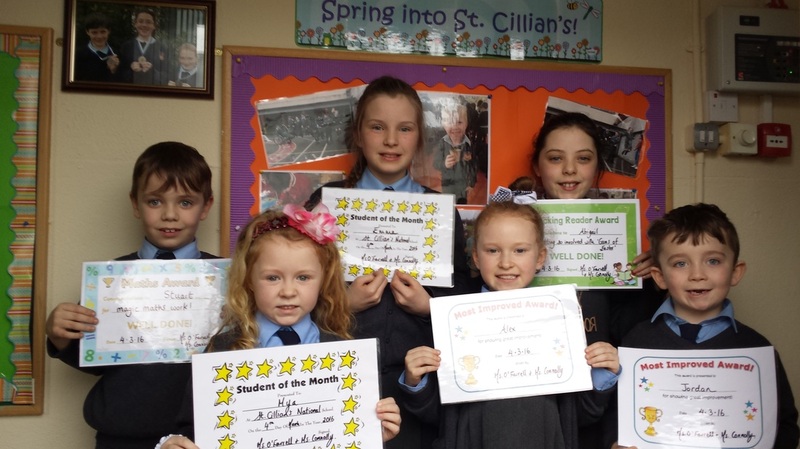 Congratulations to Emma for becoming St. Cillian's new Mathematician of the Week. Saoirse received an outstanding reading report from Ms. Wall yesterday which made her the easy choice for Rockstar Reader in the Junior Room. 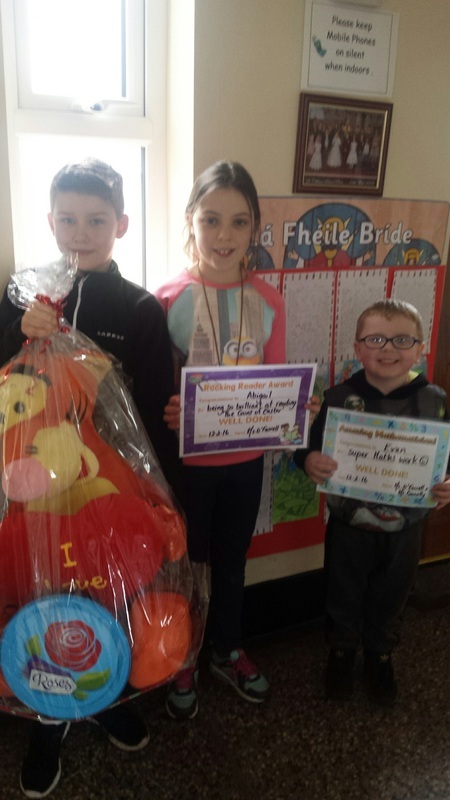 Conor and Jack were the lucky raffle winners for Punctuality and Walking to School. Super work everyone! 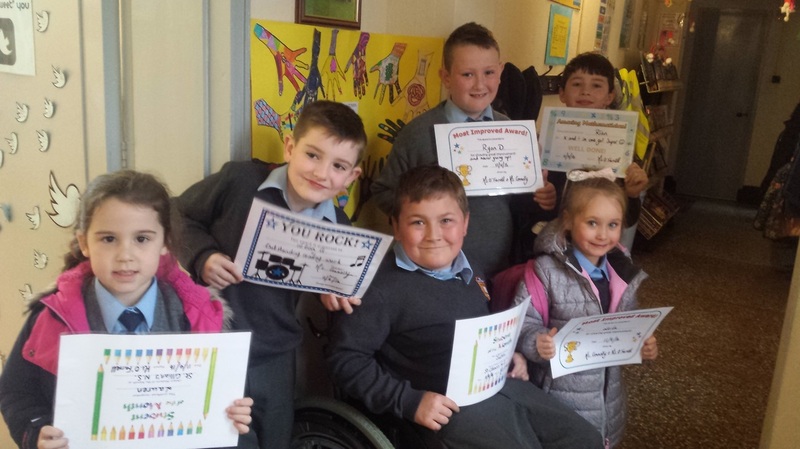 Well done to our Certificate winners from last week. 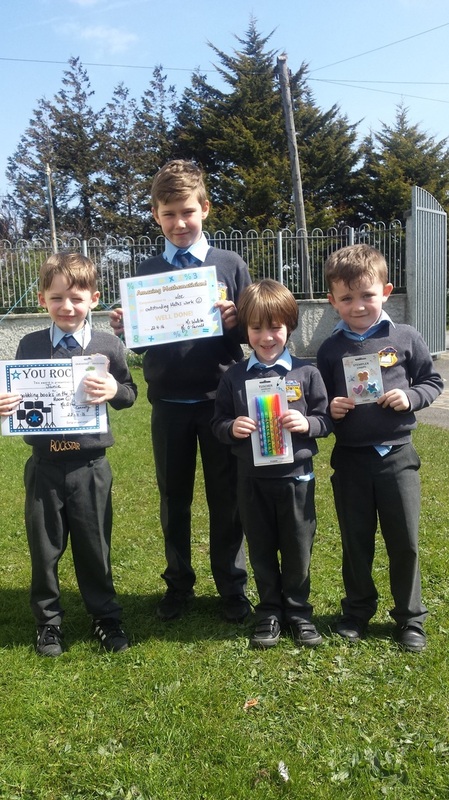 Leon and Harrison were rewarded for their puncuality by becoming our raffle winners. It was a very good week for Leon as he was awarded the Rockstar Reader Award as well....Super work! Abigail was acknowledged for her determination and her 'never give up' attitude. Wonderful to see such persistance when tackling tricky maths problems. Well done to Ianis for rocking the Rockstar Reader Award in the Junior Room. Ms Connolly mentioned that he has worked very hard on his sounds and blending in the last week. 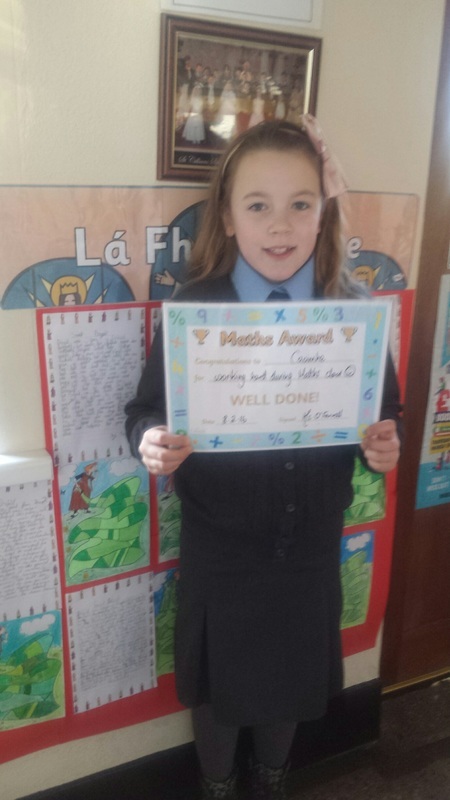 Mr Walshe was delighted with Caoimhe's maths work last week saying she used her problem solving strategies to tackle word tasks. 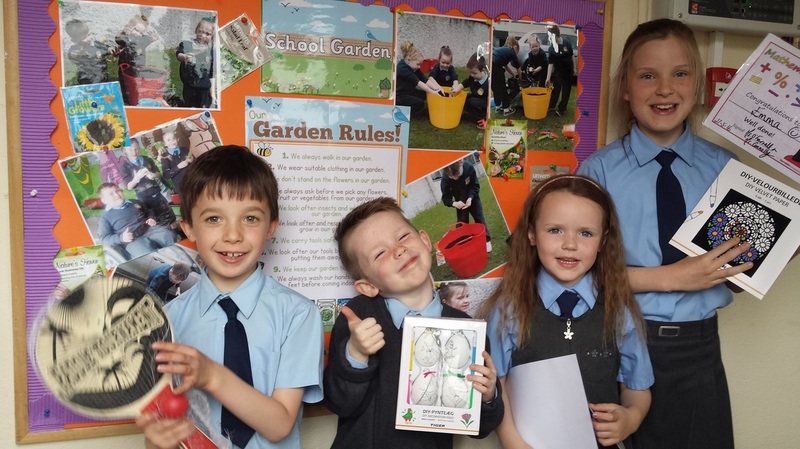 Well done to Conor and Faye for winning the 'In the Line & On Time' weekly raffle. Faye was particularly thrilled with her colouring book! Fantastic work from the boys in our school this week. Lee was honoured for outstanding work in Maths while Jamie is known for his love of books and reading. Both Leon and Jordan have excellent punctuality and were the lucky winners of the weekly raffle. All winners can choose a prize from the Punctuality Prizes Table. Well done to all certificate recipients. 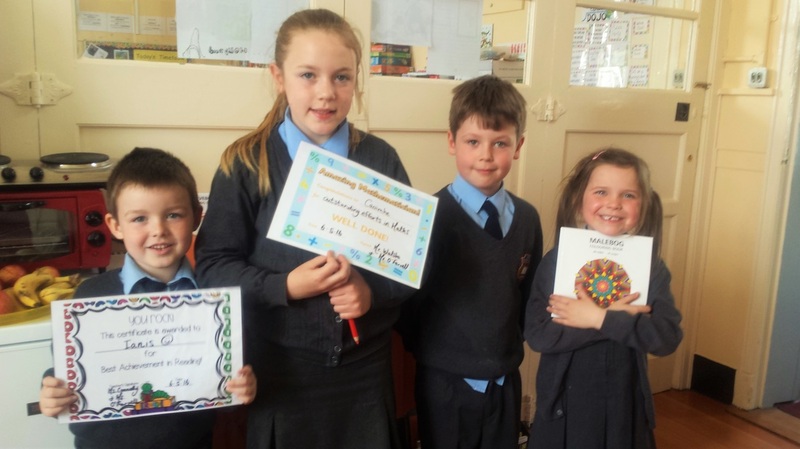 Third Class and Junior Infants had a particularly good month with Lauren and Leila receiving certs along with Ryan and Rían in 3rd Class. Justin was Student of the Month as a result of his determination while competing in the Cross Country series this Spring. He has taken on every challenge with a positive attitude and sporting attitude. Ms. Connolly noted that Leon G. is gobbling books! Well done Rockstar Reader! Today was the announcement of February's Students of the Month and Most Improved Students along with the weekly Rockstar Reader and Mathematician of the Week. 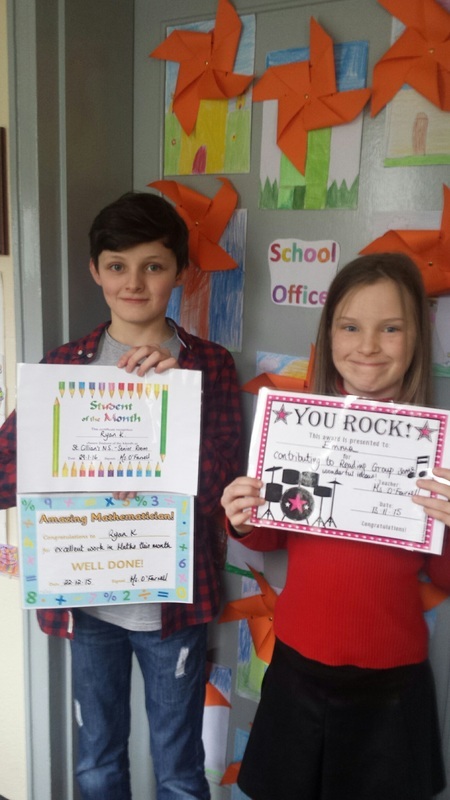 It was a big day for Senior Infants because Jordan became our Most Improved Student for February while Mya was the most outstanding pupil in the Junior Room, becoming Ms. Connolly's Student of the Month! In the Senior Room, Emma was acknowledged for all her hard work, never one to give up, she has put huge effort into her story writing: writing, editing and re-drafting. Super work! Alex received the Most Improved Student Award as she has shown great determination while tackling tricky maths word and her decoding of words while reading has improved 100%. 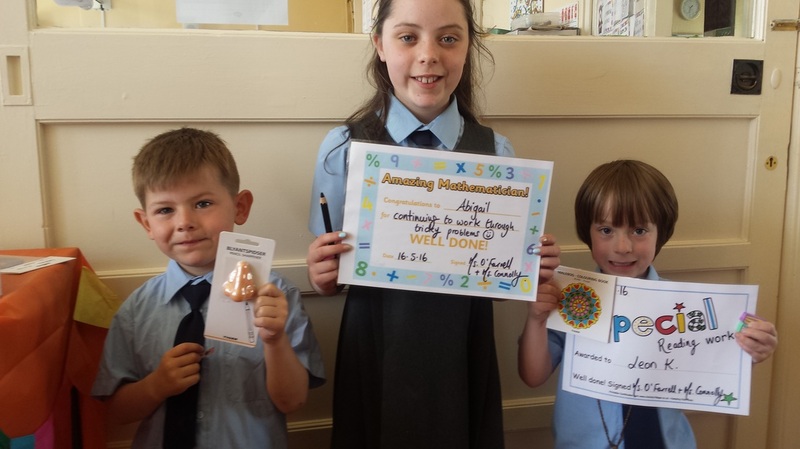 Ms Connolly mentioned that Stuart was an easy choice for Mathematician of the Week this week as he stood out as a hard worker and an enthusiastic solver of maths problems. Abigail threw herself into Guns of Easter and picked Jimmy Conway, a character from the book, as her World Book Day dress-up character. It was wonderful to see hints of 1916 style in our school so close to the Easter 1916 celebrations in a couple of weeks.